As summer draws to an end, we start to pack away our cotton dresses and daisy dukes ready for the dropping temperatures. The last of the warm summer days dribble away and it is difficult to know what to wear; outfits need to be warm in anticipation for a chilly breeze and cool enough for the last bursts of sunshine. One of the perfect fashion solutions for the anticipation of autumn is bermuda shorts; knee length shorts that are available in a variety of styles and fits to suit all body shapes and sizes. ROSAvelt has a selection of silk bermuda shorts that are perfect for wearing in the office or for relaxing afternoons in the sun. Bermuda shorts were originally worn in World War 2 by the British Army to accommodate the tropical and dessert climates. After the war, when women’s role in society changed, these knee-length shorts became a part of popular fashion and have continued to influence fashion styles ever since. For example, in Spring 2013 bermuda shorts dominated the catwalk with beautiful pieces from designers such as Nicola Miller and Diane Von Furstenberg. In the last year, short suits have become a resounding on-trend fashion; blazers and matching shorts create an edgy, chic look that is easily transformed from ‘office to out’ by simply shaking up the accessories. 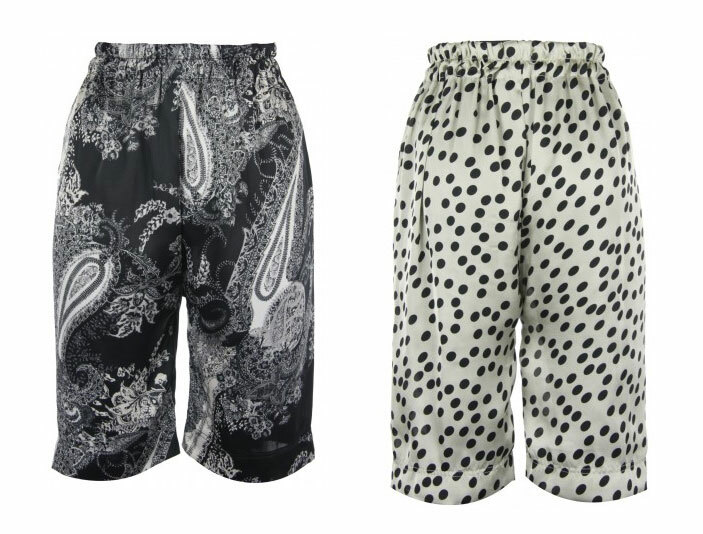 If you would like to work bermuda shorts into your wardrobe, check out these gorgeous pairs from our collection. The Printed Silk Bermuda Shorts are perfect for nights out as the bold print combined with the dark palette looks stylish and trendy. If you are looking for a more casual look, the black and white dotted Pure Silk Bermuda Shorts are a fun, playful pair of shorts that are great for days out in the sun. For more fashion information, visit our blog at www.rosaveltonline.com/blog.